Sticko stickers are tried and true favorites for any occasion and all ages. 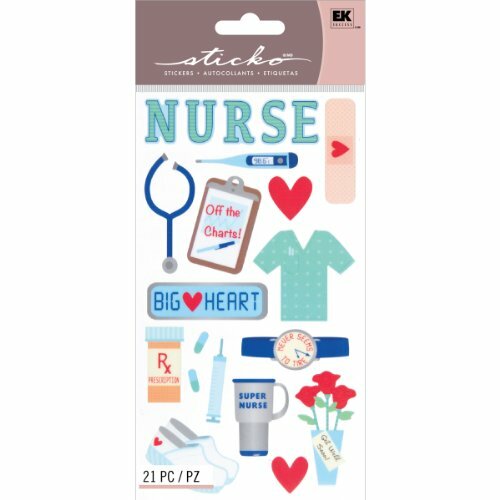 These Nurse stickers from Sticko are a great accents for scrapbooks, cards and more. Designs include thermometer, medicine, stethoscope, needle, band aid and more. EK SUCCESS-Sticko Puffy Stickers. This package contains one 7x2- 3/4in sheet of puffy stickers: dimensional vinyl stickers. Available in a variety of themes: each sold separately. Size; shape; and number of stickers per sheet varies by theme. Imported. 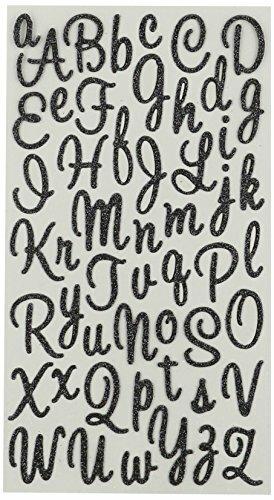 These black Sweetheart Script stickers feature upper and lower case letters with glitter. Perfect for scrapbooks, cards, notebook covers - almost anything. 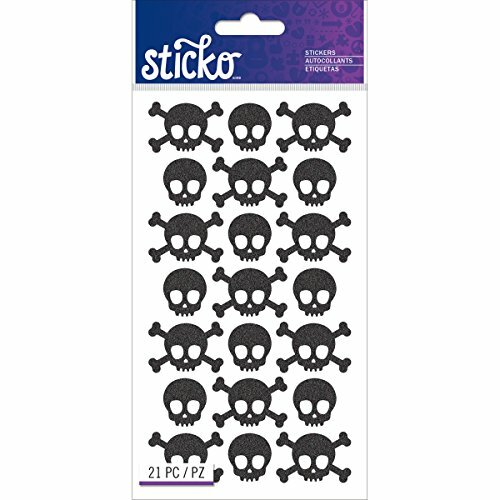 Known for their distinctive style and assortment of designs in a variety of materials, sizes, colors and shapes, Sticko Stickers are acid free and lignin free. Sticker sheet is 3-3/4-inch by 6-3/4-inch. Includes 52 pieces. EK SUCCESS-Sticko Classic Stickers. 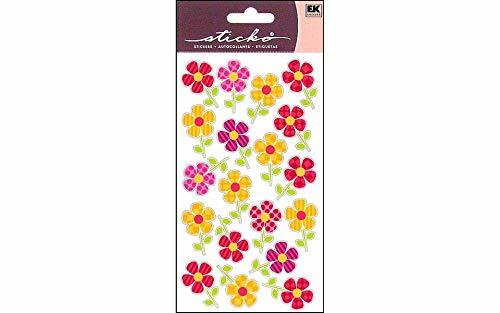 Sticko flat stickers are available in a variety of themes ideal for embellishing cards scrapbook pages craft projects and much more. Package contains one 4x7in sticker sheet of stickers. Available in a variety of themes: each sold separately. Shapes sizes colors and number of stickers per package vary by theme. Imported. STICKO-Classic Stickers. Sticko flat stickers are available in a variety of designs and themes to fit any and every occasion. They are ideal for embellishing cards scrapbook pages craft projects and so much more. This package contains Baseball four stickers on a 4x7 inch sheet. Imported. Sticko stickers are made for value and are rich in themes, colors and materials. 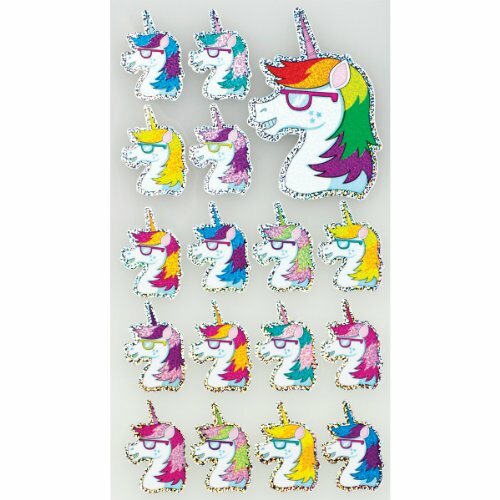 These adorable Unicorn stickers are perfect for cards, gift giving and more. These Zoo Cuties stickers feature adorable jungle critters including elephant, lion, giraffe, tiger, monkey, zebra and rhino. Perfect for scrapbooks, cards, notebook covers - almost anything. Known for their distinctive style and assortment of designs in a variety of materials, sizes, colors and shapes, Sticko Stickers are acid-free and lignin free. 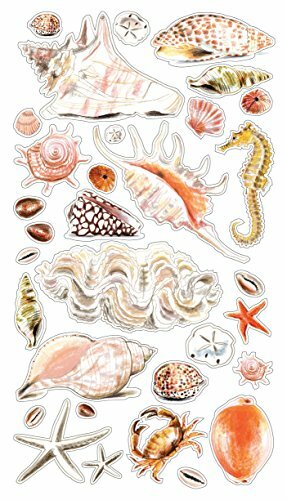 Sticker sheet is 3.75-inches-by-6.75-inches, includes 20 pieces. Sticko-Classic Stickers. Sticko flat stickers are available in a variety of designs and themes to fit any and every occasion. They are ideal for embellishing cards scrapbook pages craft projects and so much more. This package contains Black Metal Skulls: twenty- one stickers on one 7x4 inch sheet. Imported. These Beach Bums stickers feature palm trees; tie-dye t-shirt; snorkel, shells, flowers and sentiments. Perfect for scrapbooks, cards, notebook covers - almost anything. 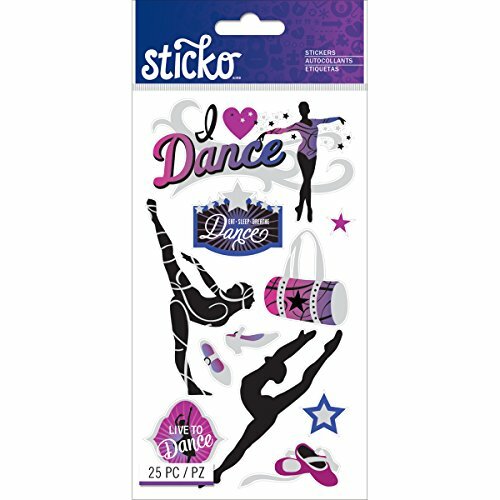 Known for their distinctive style and assortment of designs in a variety of materials, sizes, colors and shapes, Sticko Stickers are acid free and lignin free. 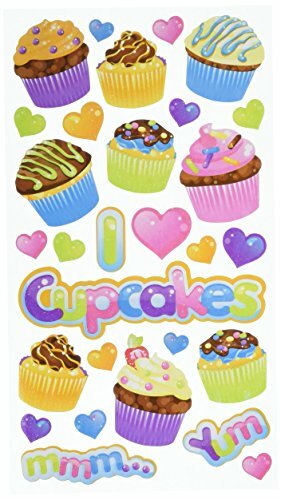 Sticker sheet is 3.75-Inch by 6.75-Inch. Includes 12 pieces. Sticko-Plus Stickers. 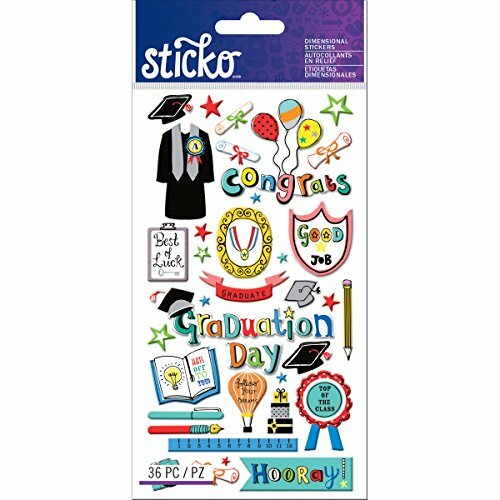 Sticko plus stickers are available in a variety of designs and themes to fit any and every occasion. They are ideal for embellishing cards scrapbook pages craft projects and so much more. The 3D look makes every project pop! This package contains Graduation: thirty-six stickers on one 7x4 inch sheet. Imported. 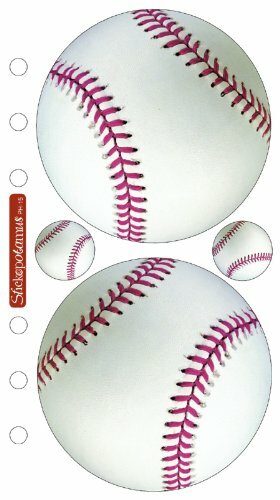 Sticko bubbles vellum stickers. They are just the thing to add a spark to cards, invitations, scrapbooking, and other creative projects! 1 sheet per package. Sticko-Alphabet Stickers. Sticko alphabet stickers are available in a variety of fonts and colors to fit any and every occasion. They are ideal for embellishing cards scrapbook pages craft projects and so much more. They make every project pop! 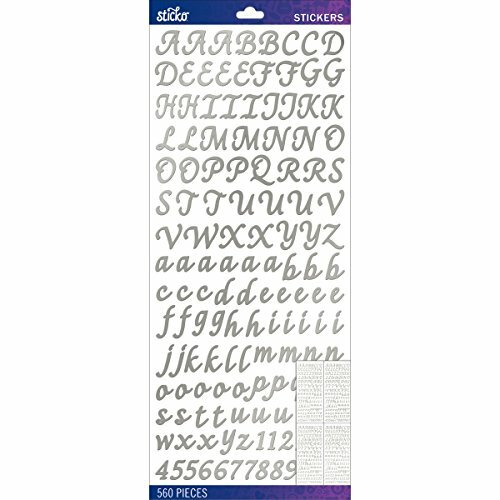 This package contains Silver Foil Script: 560 stickers on four 13x5-3/4 inch sheets. Imported. Declare your love for your furry friend with these super bright Sticko stickers. 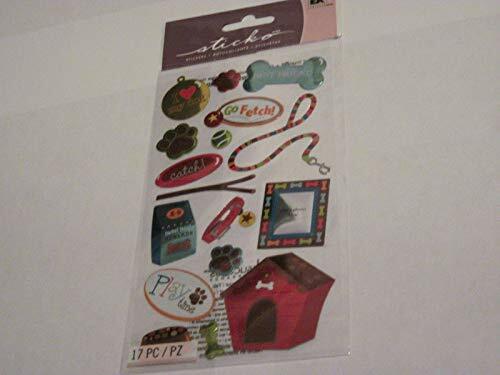 These craft stickers feature a cute dog house, leash, collar, paws, bones, and feeders that can transform any paper craft project into a bright, adorable sight. Expressions like 'Play Time' and 'I Love My Dog' add an element of fun to your DIY projects. This package contains 17 pal stickers that come in an assortment of shapes and sizes. 4 in x 7 in sticker sheet Acid free and photo safe. EK Sticko® Stickers are acid free and photo safe. Great for collecting, invitations, stationery, gift wrapping, parties, scrapbooking and much more! Use stickers in all your projects! 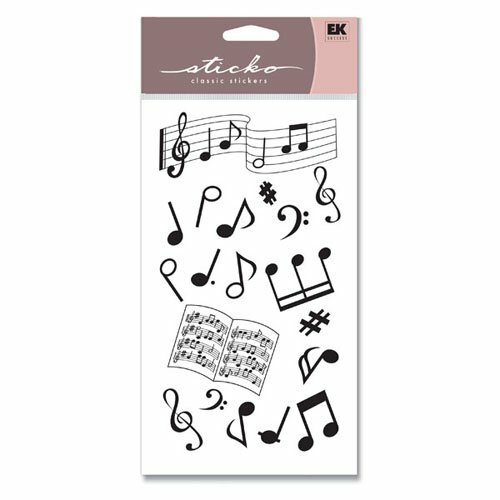 Silhouette Musical Notes- Package contains 19 total stickers, various size, 1 large bar of music, 1 open sheet of music and the rest are music notes and notations. Black and White. 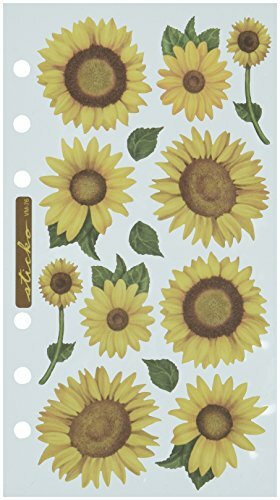 Sheet size approximately 3 3/4"x 7"
Sticko(r) Vellum Stickers - Sunflowers. 13 pieces. These Fun Flower stickers feature pretty posies with patterned petals. Perfect for scrapbooks, cards, notebook covers - almost anything. 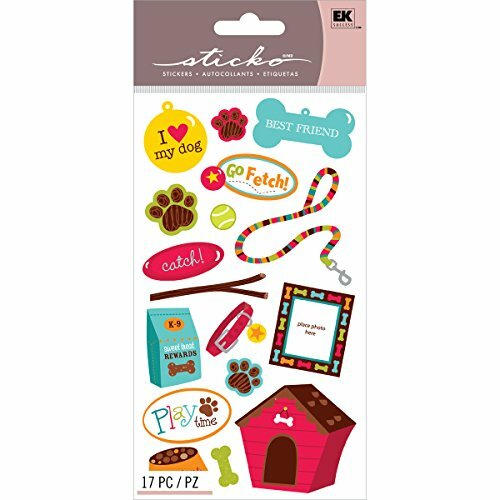 Known for their distinctive style and assortment of designs in a variety of materials, sizes, colors and shapes, Sticko Stickers are acid free and lignin free. Sticker sheet is 3-3/4-inch by 6-3/4-inch. Includes 19-pieces. STICKO-Classic Stickers. Sticko flat stickers are available in a variety of designs and themes to fit any and every occasion. They are ideal for embellishing cards scrapbook pages craft projects and so much more. This package contains Party Goodies Glitter twenty-nine stickers on a 4x7 inch sheet. Imported. 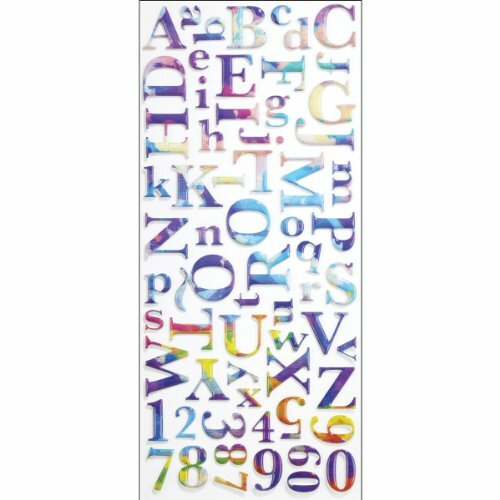 This puffy metallic Watercolor alphabet sticker set includes upper and lower case letters along with numbers in soft blended colors. Perfect for scrapbooks, cards, notebook covers - almost anything. Known for their distinctive style and assortment of designs in a variety of materials, sizes, colors and shapes, Sticko® Stickers are acid free and lignin free. Sticker sheet is 5.5-inches-by-12.5-inches. Includes 65 pieces. Sticko-Classic Stickers. Sticko flat stickers are available in a variety of designs and themes to fit any and every occasion. They are ideal for embellishing cards scrapbook pages craft projects and so much more. This package contains Dance: eleven stickers on one 7x4 inch sheet. Imported.